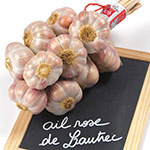 We sell our garlic in 500 g and 1 kg bunches, 1 kg strings, in baskets, trays and 5 kg bags. Pink garlic is known for its fine flavour : delicate, sweet and fruity. It is a hardneck variety (rigid stalk) and for this reason it is traditionally sold in bunches rather than strings. The outer skin of pink garlic cloves is veined with a pretty pale pink and the heads are evenly shaped. 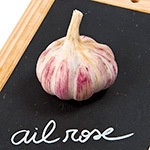 Another plus : pink garlic keeps well, in optimum conditions from one harvest to the next. > from July to April (depending on weather conditions at harvest). > Protected Geographical Indication (PGI). Available in traditional bunches (500 g and 1 kg) and in 5 kg trays. > Available in 3 and 5 kg trays. 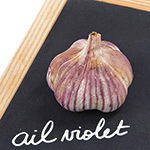 Purple stripe garlic has purple striations on the bulbs and produces a large head. It also keeps very well. 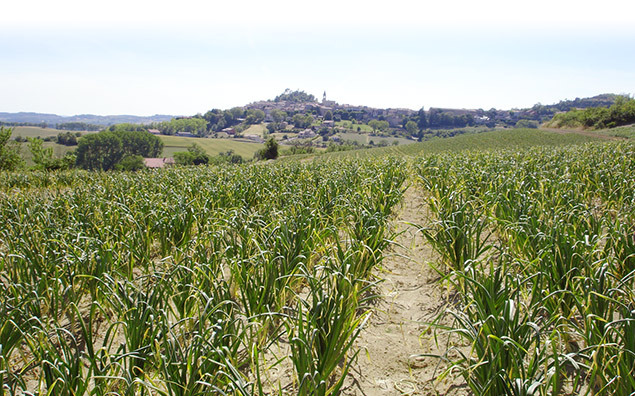 The area's sunny exposure, the local microclimate and bright light together with the choice of variety are the plus points which result in a very early season garlic with a distinctive flavour. > Available in 5 kg bags, 6 kg trays and nets of 3 heads. 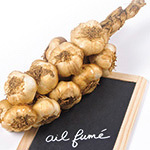 Smoked garlic is easily recognised by its golden brown colour and its smoky aroma. 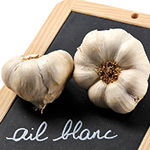 Arleux garlic was originally peat smoked to extend its keeping time and to dry it by covering it with a fine protective coating. Smoked garlic is highly aromatic. > Available in 500 g or 1 kg strings comprising 12 to 16 heads. We supply classic white garlic from May to January. We source most of our supplies from Provence, Tarn and Garonne. 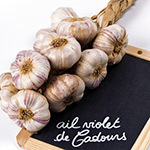 When the French season finishes – generally in March – imported produce takes up the baton with Argentine white, pink or purple stripe garlic, followed by white or purple stripe garlic from Mexico, until the first fresh French garlic returns in May, harvested in Beaumont de Lomagne (Tarn and Garonne).